At Hometown Waste, we specialize in delivering outstanding service for dumpster rentals in Central NJ, North NJ, and South NJ. We work with home and business owners to ensure they have the waste management solutions needed for smooth operation of effective projects. As a direct source for dumpster rentals in NJ, we eliminate any hidden costs, fees or surcharges that you might find when going through a third-party rental company. Choose Hometown Waste and discover how simple and stress-free a dumpster rental in NJ can be. that are perfect for your next project. 10-yard dumpsters: A 10-yard dumpster in New Jersey is perfect for small projects like one-room or partial renovations, cleaning out cluttered spaces and much more. About the size of a four-door sedan, a 10-yard dumpster can accommodate small- to mid-size items, not a lot of bulky furniture or appliances. 10-yd dumpster rentals specifically for concrete, asphalt or dirt products available upon request. 20-yard dumpsters: A 20-yard dumpster in New Jersey is ideal for mid-sized residential projects and concrete. 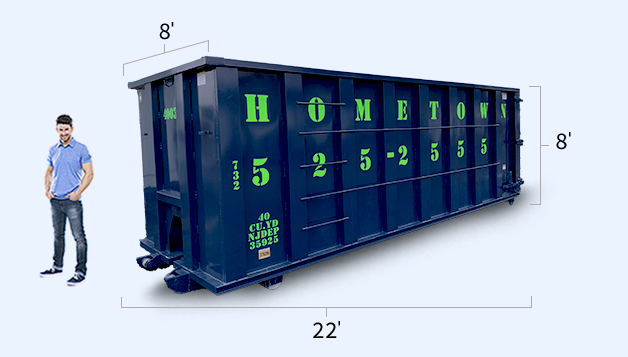 Furniture- and appliance-friendly, a 20-yard dumpster is about the size of two four-door sedans(back to back). 20-yd dumpster rentals specifically for concrete, asphalt or dirt products available upon request. 30-yard dumpsters: Take advantage of a 30-yard dumpster in New Jersey for medium to large projects such as full-home renovation and significant yard work. 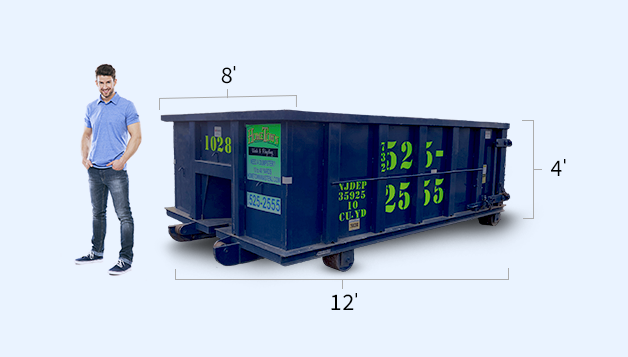 The 30-yard dumpster is large enough to accommodate furniture you need to discard as well! This is the largest dumpster available that still includes user-friendly 6-foot walls. 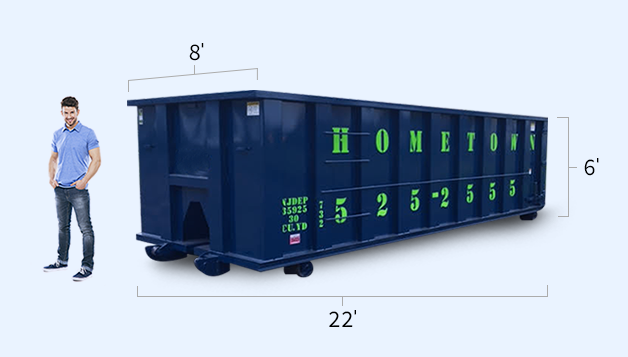 40-yard dumpsters: For the biggest commercial projects, choose a 40-yard dumpster in New Jersey. These are great for the renovation of larger homes or ongoing demolition projects that will accumulate waste over quick turnaround times. Walls on 40-yard dumpsters are 8 feet tall, which will necessitate loading equipment or machines. Our residential customers are typically in the midst of a significant project, such as home renovation, estate clean out, landscaping, roofing or another endeavor. No matter your needs and no matter your project, we can deliver fast and effective trash dumpster rental in New Jersey that makes your life easier — and ultimately saves you money. Businesses in all types of industries need roll off containers for efficient waste management. We can help ensure things run smoothly for both your employees and your customers. With a specialty in commercial dumpsters we are your rental source. Need a dumpster for a construction site? We offer containers for all types of job sites. Regardless of the project you are working on we can provide you a roll off container to meet your project's timeline and needs. NOT SURE WHAT SIZE DUMPSTER YOU NEED? We know that no two companies or homeowners have the same exact need when searching for dumpster service in NJ. That’s why we offer our dumpsters in a range of sizes. 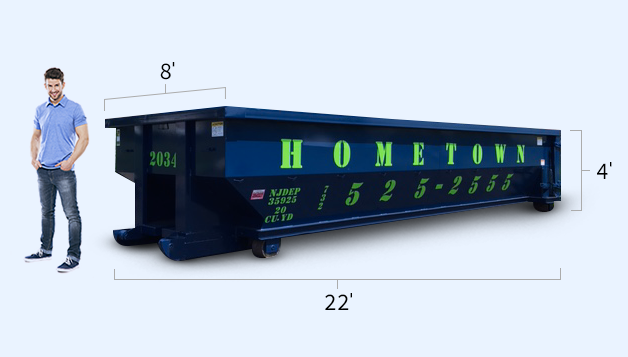 You’ll find 10-, 20-, 30- and 40-yard dumpster sizes in our inventory. Not sure what size is best for your project? Get in touch with our customer service team and one of our representatives can help you get an idea of what size dumpster rental will best fit your project’s needs. What Makes Hometown Waste Different? Do you need to a dumpster rental in central NJ? Hometown Waste is your best solution when you need a dumpster rental in NJ. We’re different because of the dependable service we provide. We believe that all residential homeowners, businesses, and organizations should have access to reliable waste management services that won’t cause any damage. We’re straightforward and transparent with our pricing. While some third-party waste management providers include surcharges and other hidden fees, we deliver the waste management solution you need without any confusing or unnecessary charges. If there’s a charge for an overweight ticket, we provide a dump ticket. Choose Hometown Waste and discover just how simple and stress-free a dumpster rental in NJ can be. In addition, we offer wood planks (by request only) to set your dumpster rental on to protect your driveway and other surfaces. We also offer same-day and Saturday delivery as well as customer service throughout the weekend. At Hometown Waste, we are the responsive, dependable company that goes above and beyond to help you with NJ dumpster rentals. 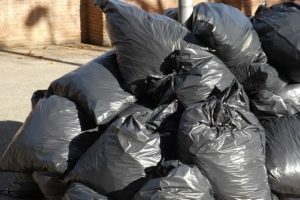 When you own a home or business in New Jersey, you should have dependable access to waste management solutions that meet your unique needs. At Hometown Waste, we see it as our responsibility to offer dumpster rental in NJ that Garden State citizens and companies can count on. 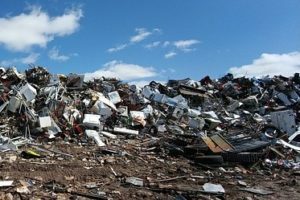 We’ve worked with scores of individuals, contractors, and organizations, and we’ve learned what they want most out of dumpster services in New Jersey. We’ve taken our experience and this customer feedback to craft pricing, products, and service that responds to your needs and helps make your life at home or work easier than it would be otherwise. We offer dumpster rentals in Middlesex County, Monmouth County, Ocean County, Essex County, Somerset County, Mercer County, and Union County.